Here you can find helpful details about MadScan, about its prices and about its service to be able to compare it with similar offers on the market. 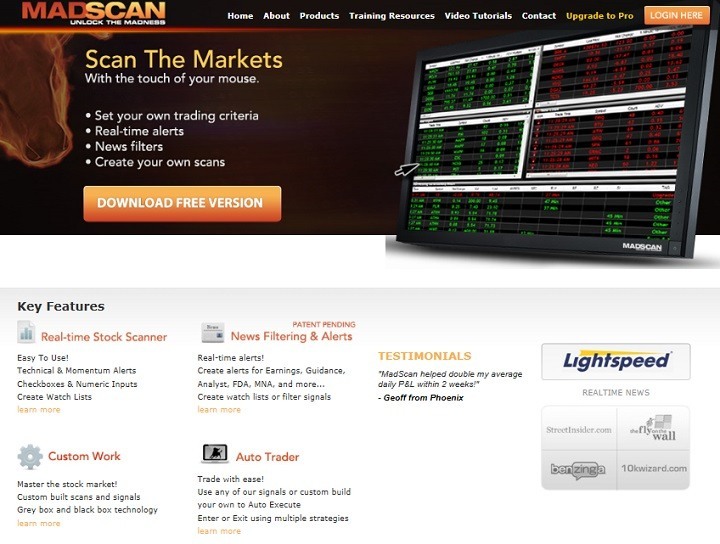 Trade Ideas Stock Market Scanner is probably the biggest MadScan competitor as of today. Can MadScan fight against Trade Ideas ﻿﻿﻿﻿Artificial Intelligence? ​Who Is ​MadScan Best For? As one of the most effective, real-time stock scanners, MadScan makes it possible for traders to watch the complete stock market instantly and directly. The users may adjust it to their personal preferences to get real time alerts for everything that is important to them and to make it work in accordance with the proprietary technology they use. Every day trader needs powerful scanners and filters for being able to follow all the countless stock trading processes simultaneously. Without this significant tool he could miss the best opportunities by being focused on just a small part while more important things are happening somewhere else at the same time. So, MedScan helps a lot when the users' individual setups and patterns pop up all at once and when no more time has to be wasted with searching for them. At the same time a truly effective and reliable scanning software increases the users' P & L.
MadScan is also offering the opportunity to set up all needed custom signals and to use the API for your individual grey box or even black box trading. After installing and testing your personal trading product, you have the opportunity to execute it with this impressing technology. This will make your life as a day trader much easier as it will work for you while you lean back and while you have nothing else to do but to check if it is working correctly. If you didn't hear anything about black box trading yet, it may help you to imagine it as your own machine, following your rules and day trading strategies, enter and exit the market day in and day out. As soon as you have determined these rules and risks and as you have confirmed by testing that they are truly your direction into successful trading, you simply include them into your live trading within MadScan. An additional advantage is the fact that this way trading is not any longer something emotional and this is surely improving the process and leading to better and faster results. On the other hand, black box trading can lead to overtrading as well. So be careful as a day trader and make sure to use Charting Tools like eSignal, VectorVe﻿st or NinjaTrader for visual trade confimation. On the website of MadScan you can find helpful videos that show you how to start setting your filters all easily. At the same time this website explains all offers, the way they operate and how you can use them most effectively. When you learned and understood all this, you will be surprised how easy it will be to install these filters and to work with them. Of course it is also possible to use the preset filters that include a large variety of patterns and set-ups for your trade. Beside this they may be your starting point when you want to set up your own filters and patterns in a comfortable and easy way. Especially in the beginning it may be necessary to ask the customer service some important questions. Make use of this opportunity. Their experts are there to help you, giving all the information needed. MadScan offers different kinds of services with different cost levels. So, you can choose the perfect offer according to your personal needs. For the beginning I can recommend the free demo version to help you with your choice. You can not try out everything, but you get a really good overview. Compare the signals with the quotes you receive through your Online Broker trading application to find out if this is right for you. You can perform scans and you can work with real time signals. You have unlimited access to all kinds of filters and scans. It makes it possible to work with NYSE, NASDAQ and AMEX exchange data. You can set up and scan your personal list of symbols. You receive streaming news in a real time mode. You can set up filters for all kinds of signals and you can install your personal watch-list for your preferred kinds of news. You receive useful proposals regarding FDA, guidance and earnings and analyst recommendations. In accordance with the news release, you get monitor signals and lists. ​MadScan is not available at the moment. 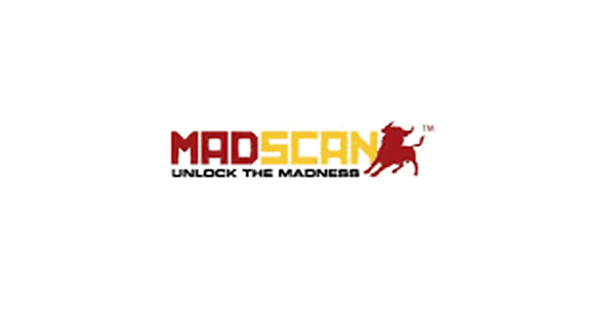 ​MadScan was mainly made for day traders. However, the service is not available right now and I recommend to read this artile: Best Stock Screener to find the best alternative. Every professional and serious trader needs this kind of service with many different features and the possibility to adjust it to his individual needs. MadScan offers this service in high quality and for a fair price. 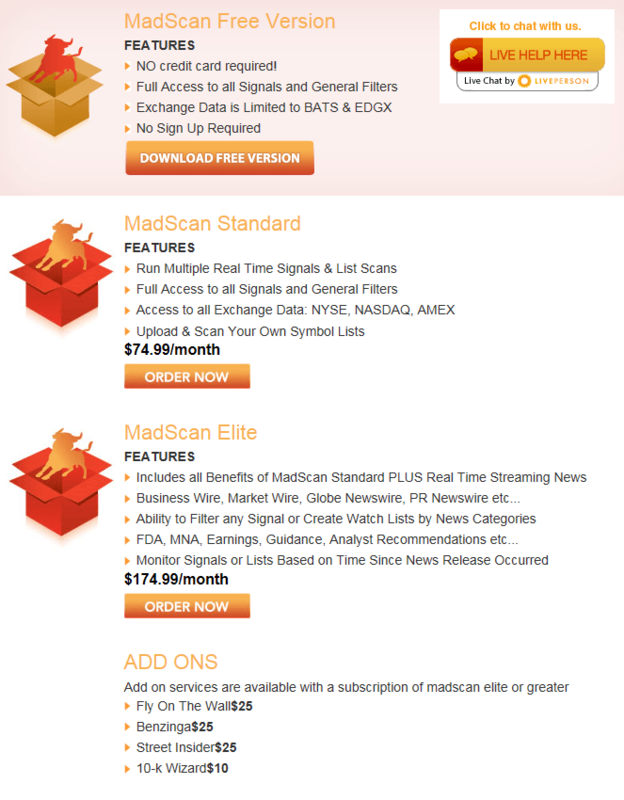 However, compared with Trade Ideas Pro, in my opinion MadScan is a little overpriced. But this depends on your individual needs and preferences. I think, it helps the users a lot to have the chance first to have a try with the free version and to find out how great it is before they have to make the decision to spend money for this product. It is a big advantage to have the opportunity for a test drive. There are high chances for you will fall in love with MadScan. Every new trader needs all kinds of effective help he can get and the best possible scanning software is making this job much easier and more successful. It is your choice - MadScan or Trade Ideas Pro. Take a look at both and compare them with each other! Don’t miss to read the Trade Ideas Review and see the reason why Trade Ideas is the #1.